Sheath evening dress is made of red silk dupioni lined in white china silk with a thigh-high slit in front and a zipper closure in back. It is embellished with hand applied white silk flowers enhanced with royal glitter. 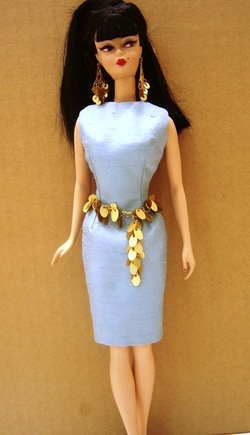 Gown fits Fashion Royalty, Barbie, Silkstone, and other 11 1/2 inch dolls. Doll, earrings, & Shoes NOT included. This is my intrepertation of the playing card attending The Mad Hatter's Birthday Party. Dress made to fit Ellowyne, will also fit Tyler. Fashion Only. Doll and shoes not included. This elegant sleeveless silk sheath is the go to dress every well dressed doll must have in her closet. Made of light blue dupioni silk, it is fully lined in white with a zipper closure in back. 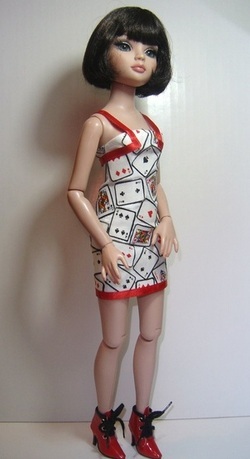 Fits Barbie, Silkstone, and Fashion Royalty. Doll, Earrings, Belt and Shoes NOT included. Insurance is required and included with shipping.